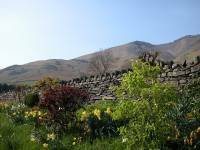 On the first day of a fine Mayday weekend I'm setting out to visit all of Blencathra's tops, a walk of nine miles involving around 2800 feet of ascent. 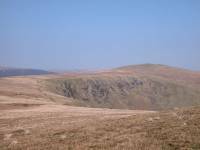 I've chosen to attempt this walk on a Saturday for the reason that, at this time of year, it's the only day of the week that the bus from Keswick to Caldbeck operates. I was nearly out of luck on this occasion as the bus had hit an obstacle on the road early in the morning, but after some delay it was declared roadworthy and set off, with just one other passenger apart from me. 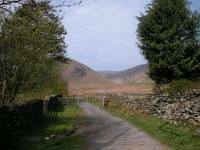 The bus dropped me at the village of Mingrisedale and I set off along the track to the east, leading into the valley of Bannerdale. 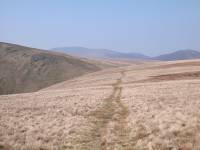 Just after starting off I took this shot looking back at Mungrisedale. 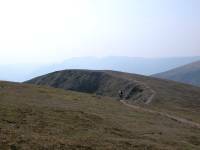 The path enters open country almost immediately. Here I'm walking alongside the Glenderamackin river. 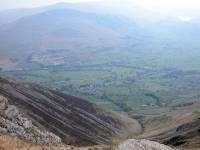 The cliffs of Bannerdale Crags are visible at the head of the valley. 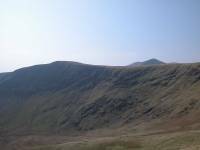 Nearing the foot of the Tongue, the east ridge of Bowscale Fell. 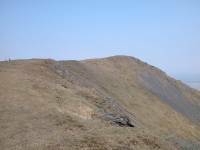 The fell can be climbed by this ridge but I'm planning an easier ascent. 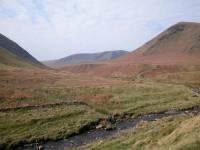 The river has meandered off to the left and now the track is leading into Bannerdale. 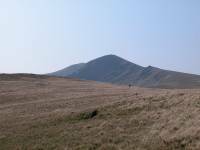 That's Bannerdale Crags, which will be the day's second objective, straight ahead. 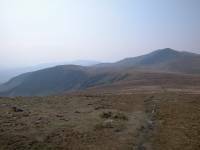 The path now climbs steadily up the southern shoulder of the Tongue, heading for the col between Bowscale Fell and Bannerdale Crags. The path is steeper than it looks. According to Wainwright this is one of the oldest walking routes in the district. I'm having to take frequent rest stops, not being very fit after a winter of indolence. Here I'm looking across Bannerdale to the felltop. 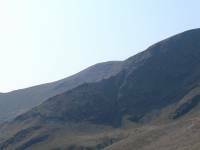 Blencathra is beginning to appear above the immediate ridge line. Looking back down Bannerdale. 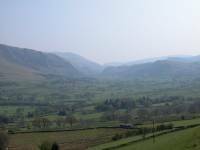 Mungrisedale village is lost to view. 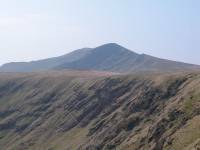 Bannerdale Crags in all their glory, with Blencathra's north top of Atkinson Pike immediately behind. The col at last! Atkinson Pike looks very daunting from here. 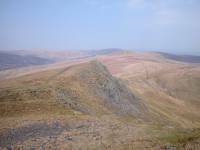 Looking north from the col, and Bowscale Fell is just a few minutes away. 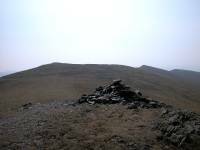 The summit cairn is already visible. 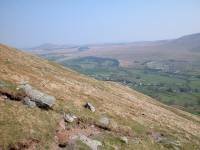 And this is Bowscale Fell, my first objective of the day and my 143rd Wainwright. 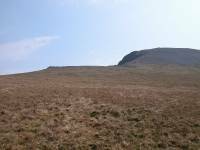 It's 2306 ft above sea level, and just over 1450 ft higher than Mingrisedale, 2½ miles back. 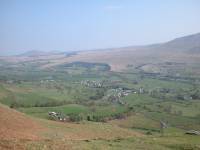 Looking north across the vale of the Caldew to Carrock Fell, 2½ miles away. 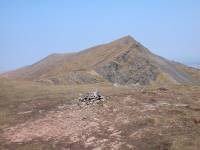 Looking south, back to the col, with Bannerdale Crags to the left and Blencathra to the right. 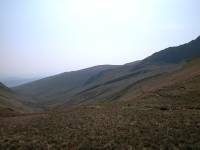 I've walked back down to the col and I'm now continuing southwards along the lip of the crags. There's a steady east wind blowing. 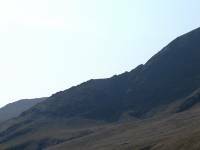 Atkinson Pike looms large on the other side of Bannerdale Crags. 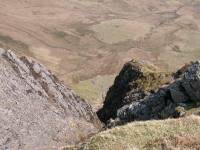 An "oo-er" moment on the lip of Bannerdale Crags. This would not be a good place to walk if the wind was in the west. Another giddy view down into Bannerdale. 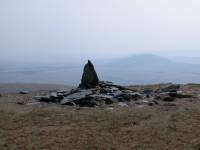 The cairn that marks the nominal top of Bannerdale Crags, with Great Mel Fell in the distance, a hill that I climbed a year ago to the day. The cairn again, with Bannerdale behind. 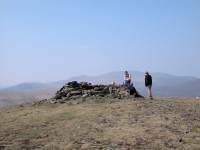 The cairn is not actually at the true summit of the fell. 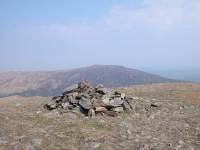 This is the true summit of Bannerdale Crags, about a hundred metres west of the cairn and unmarked. 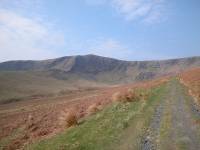 To the southwest is the "saddle" of Blencathra that gives it the alternative name of Saddleback. 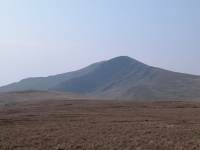 Blencathra is at the south (left) end of the saddle, Atkinson Pike at the north end. 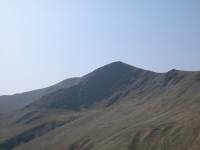 Bannerdale Crags has an elevation of 2230 ft. 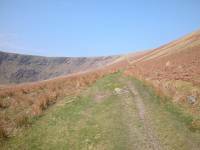 I'm now following the path along the other side of Bannerdale Crags, to the west. 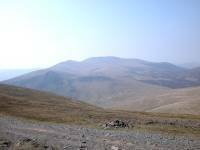 The Glenderamackin col is just ahead, and Skiddaw is coming into view in the distance. 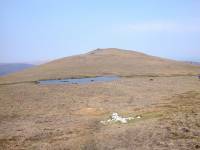 The path to the Glenderamackin col is not marked on the OS map, though Wainwright's guide of 1962 shows it clearly. Nearing the col now, and a close-up of Atkinson Pike. 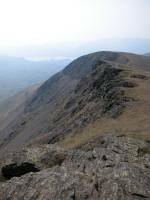 Zooming in, we can see Sharp Edge - the east ridge of Atkinson Pike and one of the scariest aretes in England. 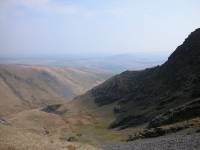 Sharp Edge is an unusual feature in the northern fells, which are mostly smooth and rounded. 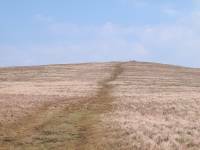 It is regarded as beyond the capabilities of many ordinary walkers and is dangerous in wet weather. Another close-up of Sharp Edge, which is crowded on this sunny Saturday. 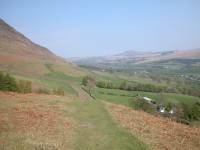 The view down the Glenderamackin valley, along which there's a path to Scales. 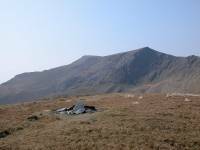 My third objective for the day is not Blencathra itself but another top, that of Mungrisedale Common. 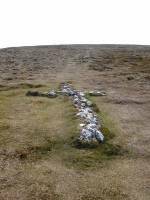 It lies to the northwest of its parent fell and is reached by following a path, probably a sheep track originally, straight on from the Glenderamackin col. Here I'm looking back at Atkinson Pike. 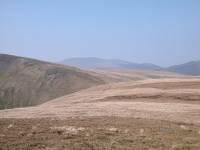 In Wainwright's day the summit of Mungrisedale Common was unmarked, and with good reason - it's little more than a sprawl of featureless moorland, virtually flat, with almost nil reascent from Blencathra itself. 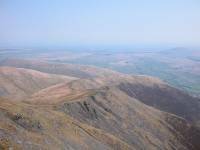 Walkers still wonder why Wainwright classified it as a separate fell, and there are two theories - either he included it as a joke to see how many walkers would seek out the summit, or he was desperate to fill pages in the Northern Fells volume. 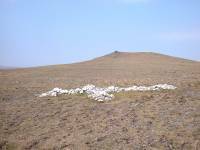 Thanks to its inclusion it now has a cairn, on which no less than seven paths converge. The height is given as 2068 ft.
Wainwright was scathing about this top, commenting that "it has no more pretension to elegance than a pudding that has been sat on." Nevertheless, on a sunny day like this it has a certain charm. It counted as my 145th Wainwright. 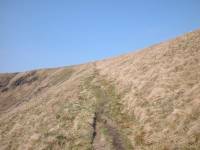 There's a direct and obvious path back to Atkinson Pike. 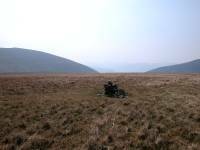 This is a retrospective view of Mungrisedale Common. 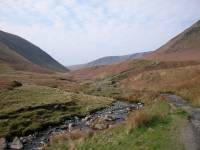 The head of Roughten Gill to the south, which leads into the Glenderaterra valley between Blencathra and Skiddaw. Heading directly for the foot of Atkinson Pike now, and the gradient is steepening. 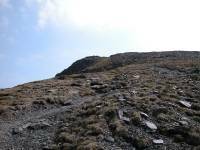 That's the path up beside Foule Crag, which is littered with loose slate and is slow going. 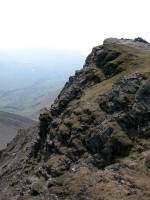 This is a good viewpoint for Sharp Edge. 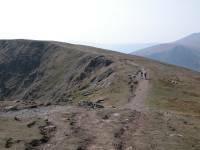 A close-up of Sharp Edge, crowded with walkers. I don't envy them. 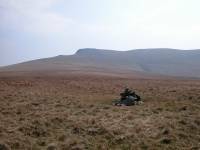 A look back at the nameless bump north of Atkinson Pike, with Bannerdale beyond and to the right. 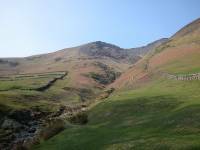 The slaty east side of Atkinson Pike, known as "blue screes". 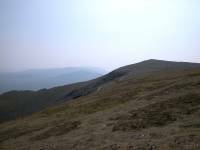 Up to the summit ridge at last, looking to Blencathra's principal summit of Hallsfell. 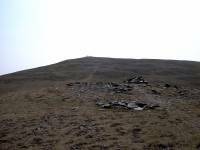 This is the summit cairn of Atkinson Pike, looking benign and giving no hint of the majesty of its supporting slopes. 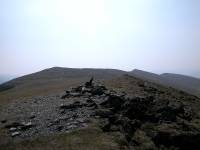 The summit of Atkinson Pike again, looking north. 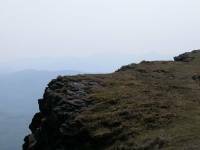 There's a second cairn, seen here, which has the illusion of looking higher than the first. 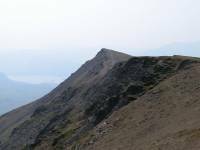 It's an easy stroll across the saddle to Blencathra proper. A feature of the saddle is the pair of quartzite crosses each side of the col. This, the larger of the two, is the work of Harold Robinson, who extended an existing small cross immediately after the second world war. 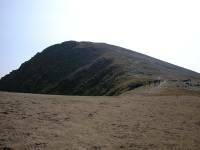 The col between Atkinson Pike and Blencathra. The second cross. Its builder, like its purpose, is unknown. 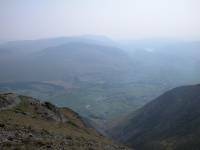 Looking north across the col from the short ascent to Blencathra. As you arrive at the summit there's a "wow!" moment as the view to the south is revealed. 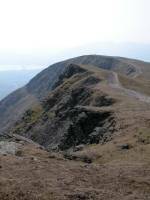 Clough Head and Thirlmere seen across the Keswick - Penrith gap. 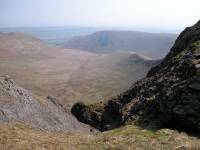 The view to the east, with the lower part of Sharp Edge in shot with Souther Fell beyond. The summit. 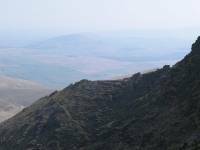 When I arrived at the top there were no less than thirty three other walkers already present, plus two dogs. 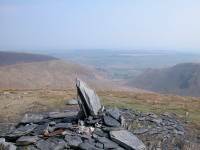 Surprisingly, for a hill as prominent as Blencathra (an English Corbett at 2847 ft), there is no Ordnance Survey trig pillar, just a simple cairn. 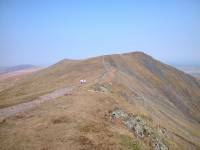 Scales Fell, the southeast ridge and the most popular ascent route of the fell. A rare moment of solitude at the summit cairn allowed me to get this shot of the ridge westwards to Gategill Fell Top, with a glimpse of Derwentwater beyond. It's an easy walk along the ridge to the west, with a lot of rock architecture to enliven the journey. 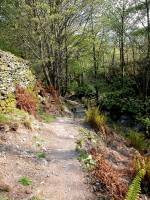 At the head of one of the many gullies a view opens out southwards down the length of Thirlmere. 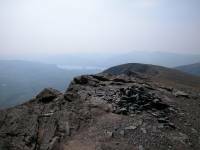 The highest point of the skyline, almost in the centre of shot, is Helvellyn. 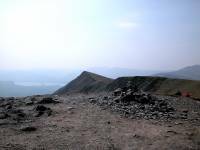 A look back at Blencathra's summit. 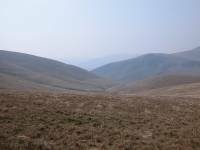 Looking towards the northwest, this is probably the best shot of Mungrisedale Common that it's possible to get. 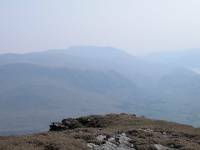 Dramatic scenery near the top of the Gategill ridge. The crag of Gategill Fell top. 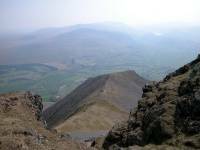 The retrospective view of Blencathra's "saddle" to the east. 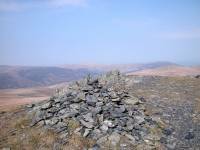 The summit of Gategill Fell Top, which qualifies as a Nuttall and is 2792 ft above sea level. 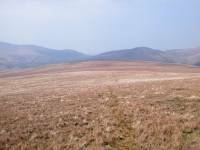 Looking westwards along the ridge to Blease Fell. 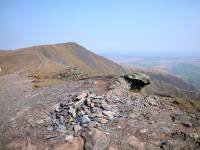 Looking the other way from Gategill Fell top, back towards Blencathra's principal summit of Hallsfell. Another nameless outcrop along the ridge path to Blease Fell. You can't beat scenery like this. 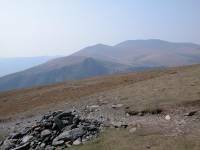 ...and one of Helvellyn to the south. 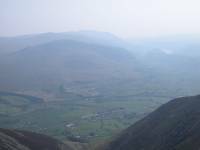 It's very hazy, but just for the sake of completeness that's Scafell Pike in the distance to the southwest. 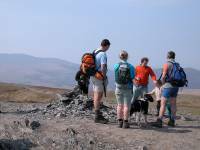 It's a good two miles along Blencathra's summit ridge from Hallsfell to Blease Fell, and it's packed with interest all the way. 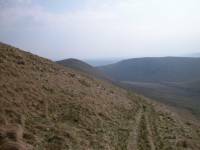 The final ascent of the day as I approach Blease Fell. 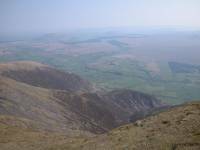 Blease Fell, Blencathra's westernmost top, 2638 ft above sea level. 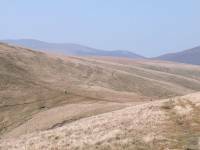 A splendid view across the Keswick - Penrith gap towards Clough Head. 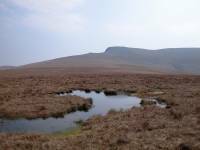 Gategill Fell from Blease Fell. 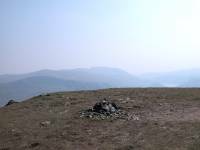 The little summit cairn, with a glimpse of Thirlmere behind. 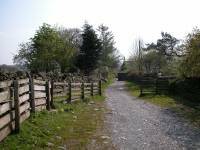 A broad path leads off to the southwest, straight towards Keswick. 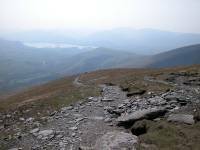 Skiddaw from the descent path. 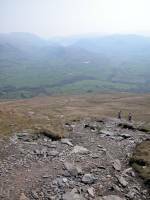 Blease Fell is the western shoulder of Blencathra, and it's a huge, convex half dome. The gradient steepens as you descend. You have to take the descent slowly. It's long and tedious and is hell on the knees and the calf muscles. 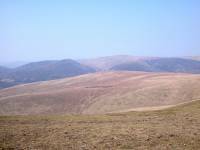 A shot to the southeast on the long descent of Blease Fell. 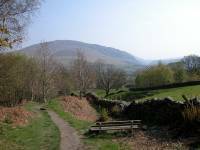 The path gradually curves around to the left to approach Threlkeld. 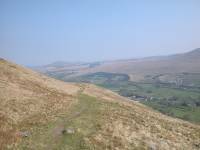 The only problem with Blease Fell is that it lacks a path down into the Glenderaterra Valley, which would make a great end to the day and would be handy for Keswick. It could be done, if you want to tackle steep trackless grass, but it wouldn't be at all pleasant. 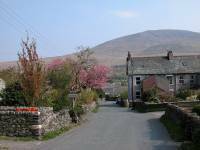 ...and then Threlkeld village itself. 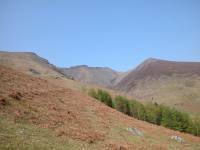 Here we can look back up the ravine of Blease Gill to the summit ridge. 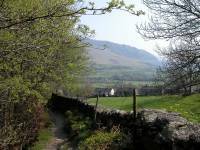 The path approaches Threlkeld at last, but there are still steep descents to come. The path has benign stretches like this but other parts are badly eroded. St John's Vale to the south. 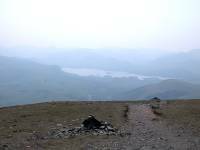 Thirlmere is no longer visible. 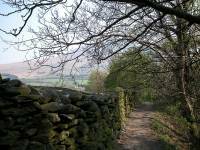 The path runs up against the intake walls just north of Threlkeld. 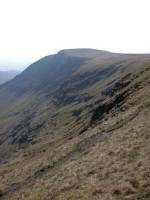 A dramatic view of Blease Gill. Blease Gill from the gate. 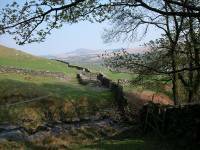 The path now leads into Threlkeld alongside the wooded lower reaches of Blease Gill. 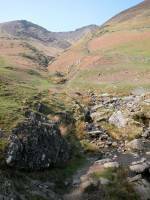 The path along Blease Gill to Threlkeld. 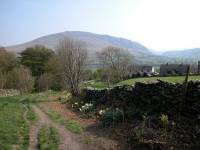 A lovely view of Clough Head. 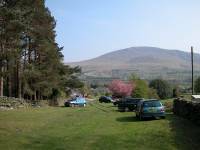 ...leads down to the car park. 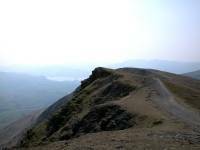 A last look back at Blencathra. 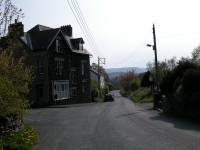 All that remained was to walk down through the village to the bus stop. 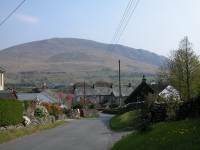 Threlkeld, laying off the main road, is very quiet. There's the bus stop. I've timed it well, just ten minutes to wait. 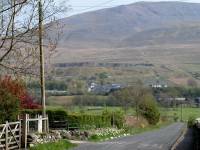 So just time for this final shot, across to Clough Head and Threlkeld quarry. Now available on CD - the high resolution (2560 x 1920 pixel) originals of the images on this gallery. 132 images, 186MB of data. (includes some images not selected for the website).